The social media platforms studied-Twitter, Facebook and blogs-did not follow the pattern of the mainstream press during the final weeks of the campaign. They also did not follow each other. Romney’s closing week on Twitter was the most positive he experienced during the entire general election, even while Obama was having his best week in the blogosphere. And on Facebook, the final week brought relatively little change. The closing weeks on Twitter for Romney and Obama differed significantly. During the penultimate week of the campaign, October 22 to 28, the conversation about Obama was much better than about Romney-as it had been throughout the general election. During that week, 26% of the assertions about Obama were positive compared to 44% negative, while for Romney, 22% were positive and 55% were negative. That changed markedly for Romney, however, in the final week. From October 29 to November 5, roughly a third (32%) of the conversation about the GOP candidate was positive compared to 45% negative, a difference of 13 points. While this was still negative overall, it was by far the best week Romney had on Twitter during the general election after Labor Day. It also marked the only occasion when Romney’s tone of conversation on Twitter was close to that of Obama’s (27% positive and 41% negative), in this instance actually besting the president by one point. What accounted for this improved tone for Romney in that final week? A closer examination suggests that supporters of Romney went to Twitter to share their optimism that Romney could win the election and that excitement around his campaign was growing. "#Boehner says #Romney will win #Ohio, despite auto bailout issue," tweeted Esmir Milavic while linking to a story on the CNN website. "[Counselor to George W. Bush, Ed] Gillespie: Undecided Voters Will Win Race for Romney," shared @UnsureVoters. Endorsements were also key in the final week. "Four Major Iowa Newspapers Endorse Romney," tweeted @MrBlog1. "Good for her ‘Former Hillary aide backs Romney’," added Tammy Bruce reacting to the news that Clinton’s former Senate state director, Gigi Georges, endorsed the Republican nominee. Obama saw no such dramatic surge on Twitter in the final week. It did mark the fourth straight week of improved tone, but was only slightly better than the week before. And the optimism shared by Romney supporters was not as evident for Obama supporters. The other difference in the last week is that the amount of conversation on Twitter about each candidate decreased significantly from the previous week (if you exclude the Monday before the election). From October 29 to November 4, Romney was the subject of 2.9 million assertions compared to 3.9 million for Obama, down from more than 5 million devoted to each the previous week. Most of this decrease is likely attributed to the immense attention that Hurricane Sandy and its aftermath received online. According to Twitter, from October 27 to November 1, users sent more than 20 million tweets related to the natural disaster, meaning that the attention of many users appeared to be diverted away from the campaign. The trajectory of conversation on blogs during the final two weeks of the campaign differed significantly from Twitter. 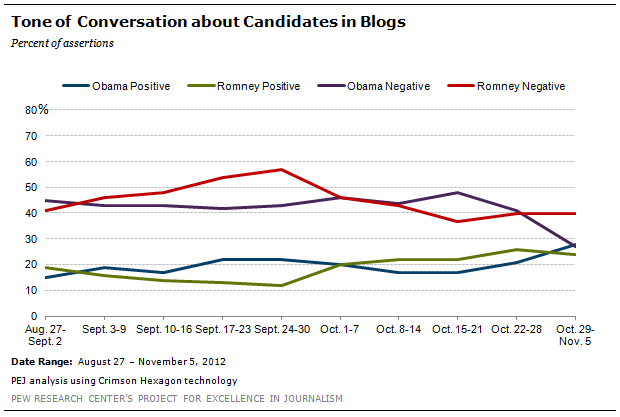 The second to last week saw a slight advantage on blogs for Romney (26% positive and 40% negative) over Obama (21% positive and 41% negative). However, during the final week, the discussion shifted dramatically in a positive direction for Obama. Indeed, the conversation about Obama in the last week on blogs was slightly more positive than negative-something that did not happen any other week for either candidate on the three main social platforms. The level of negative discussion about Obama dropped from 41% to 27%, while the amount of positive discussion rose from 21% to 28%. In this regard, blogs, unlike Twitter and Facebook, more closely followed the mainstream press as Obama’s coverage there also improved dramatically in the closing days. For Romney, the final week did not mark much of a change from earlier weeks. There, 24% of the conversation was positive compared to 40% negative. On Facebook, contrary to Twitter and blogs, the final two weeks of conversation saw relatively little change for either candidate. For Obama, the final weeks were virtually identical. 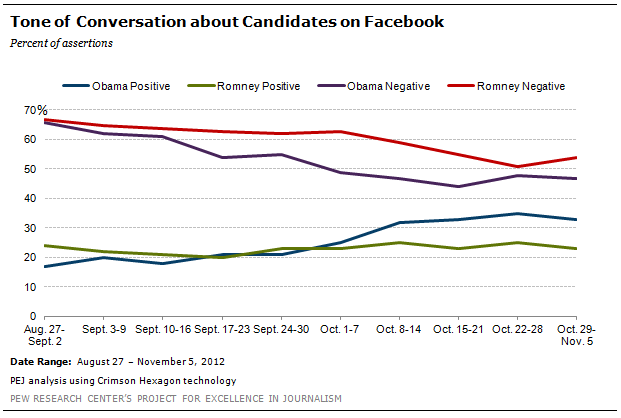 From October 22 to 28, 35% of the Facebook conversation was positive compared to 48% negative. The next week, 33% was positive and 47% was negative. Romney, on the other hand, saw some change in a negative direction during the final two weeks, but the change was not nearly as large as on Twitter or blogs. During the second-to-last week, 25% of Romney’s discussion was positive while 51% was negative. For the last week, the conversation became a bit worse for Romney, as 23% was positive and 54% was negative. The Crimson Hexagon software used to analyze social media measures text in the aggregate. Therefore, the unit of measure is the ‘statement’ or assertion, not the post or Tweet. One post or Tweet can contain more than one statement if multiple ideas are expressed.